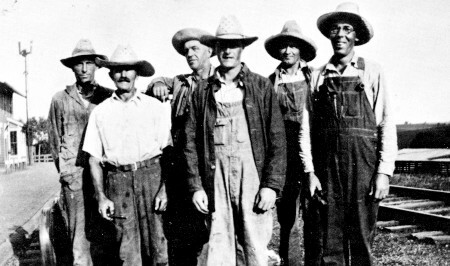 In about 1929, the Aspinwall section crew members were, from left, John Schilling, Andrew Babik, Harry Kruetzfeldt, Harry Schroeder, William Jensen and foreman William Schroeder. The depot is shown at the left and the stockyards at the right. In 1906, four trains in each direction were on the Milwaukee lines; only one of them, a Savanna, Illinois - Omaha local, halted at Aspinwall. During 1916 there were still four passenger trains each way, and only the Perry - Manilla local paused at Aspinwall, with an important exception: westbound only, the Colorado Express, a train to Denver carrying sleeping and cafe-observation car, stopped at Aspinwall to discharge passengers traveling from Chicago. In 1926, local trains 3 and 4 making all stops between Chicago and Omaha stopped regularly at Aspinwall. The westbound train operated overnight and carried a sleeping car, and the eastbound train was scheduled in daytime. Additionally, the Arrow would stop in either direction for long-distance riders, and the eastbound Pacific Limited (from San Francisco) would leave off passengers from origins in the far west. In 1936 passenger service had receded to two trains each direction, of which only the local (overnight with sleeping car) paused in our community. It took 15 hours to travel between Chicago and Omaha. The Arrow, stopping only at larger towns, did the trip in 12 hours. In December 1940, the fast daytime Midwest Hiawatha streamliner was placed in service on an eight-hour schedule Chicago - Omaha. It replaced the overnight local trains, and the Arrow had several additional stations added to its schedule. Aspinwall thus again had sleeping, lounge and dining car service, but this did not last for long. In May 1941, Aspinwall was discontinued as a stop for any passenger trains. Freight trains, however, continued to be an important part of nearly all of Aspinwall's past 100 years. Lumber, cement, sand, bricks, and nearly all other building supplies had to be hauled in by rail for homes, barns and businesses; automobiles, gasoline, oil, tires, kerosene, batteries, motorcycles and farm implements were brought in for the implement dealers and garage before the days of truck service; hardware, feed, block salt, grocery items, dry goods, and all other supplies used in the farms, businesses and homes were railed to the Aspinwall depot, also the drop-off point for mail sacks for the post office. Meanwhile, livestock and grain were shipped out to markets in Omaha, Chicago, Sioux City and even the East and West Coasts. The volume of business at Aspinwall was large enough that a freight agent remained here until 1957. After that time, freight trains would stop as needed. As of March, 1980, the Milwaukee had discontinued all service through Aspinwall. The tracks between Sioux City and Manilla have been removed, with a similar fate likely for the Manilla to Council Bluffs tracks. The line between Manning and Perry is on a tenuous status, held together only by the construction of the large soybean processing plant at Manning. Sixty years earlier, however, the railroad business was booming so much that the Milwaukee had double-tracked its line from Sabula, on the Mississippi River, through Aspinwall and to Manilla. The work was started in 1912, and by 1913 was in full swing in the western part of the project. The new line was north of the original track, and from Aspinwall to the west made a sharp turn to the north. Again, railroad officials met with landowners about obtaining right-of-way rights. H.A. Sutherland of Manilla served as a local representative for the railroad, working with the landowners about disputes, the need for cattle passes, and so on. The right-of-way rights were given for sums ranging from $10 to $100 in this area. mission to pile materials on a portion of his land. These materials were used for the construction of the concrete underpass at the northeast edge of town; for this, Roggendorf received $10. The Aspinwall Depot, center of much of the activity of the town, was probably built in 1883; documents show a quit claim deed for $1 transferring land for the depot from the Milwaukee Land Company to the Chicago, Milwaukee & St. Paul Railroad. The 24 by 70 foot building was remodeled in about 1908 to include living quarters for the depot agent; Art Case served the post from 1909 until 1913, with at least one of his three daughters born in the upstairs apartment. Meanwhile, Ed Brady had lost an arm in a railroad accident, the Milwaukee trained him to be a depot agent, and named him to the Aspinwall station as well. Both served until 1913, one during the day and the other one at night; this was the time that rail traffic was so heavy that the Milwaukee decided to double-track its line across Iowa. Brady, who was married in November, 1910, first lived in the apartment at the rear of the general store, and son George was born there. The family, which grew to include five children, later moved into the depot's two-bedroom apartment. They also had a living room, dining room, pantry, and at first had to get all their water from the cistern across the street at the store. Mrs. Brady carried water to the freight room of the depot, where she had her washing machine. The depot, which was moved to the south after the new tracks were finished in 1914, remained the Brady home for nearly 40 years; Mrs. Brady even stayed in the building with her children as it was being moved to its new location. This concrete underpass, or viaduct, east of Aspinwall and another a mile west of Aspinwall were constructed in 1913. Note the crude cars on the track used to haul in the dirt which built up the embankment. Numerous men were needed to build the new line through Aspinwall. The farm on the left of the picture is now the Roland Meeves farm northeast of town.